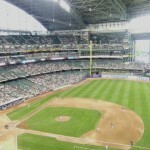 Outside what ballpark can you smell brats being cooked on a grill and fans cracking open their favorite cold beverage? 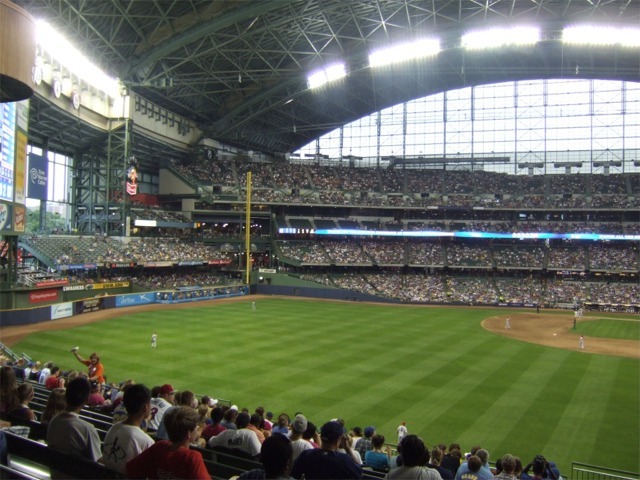 If you guessed Miller Park in Milwaukee you are correct. 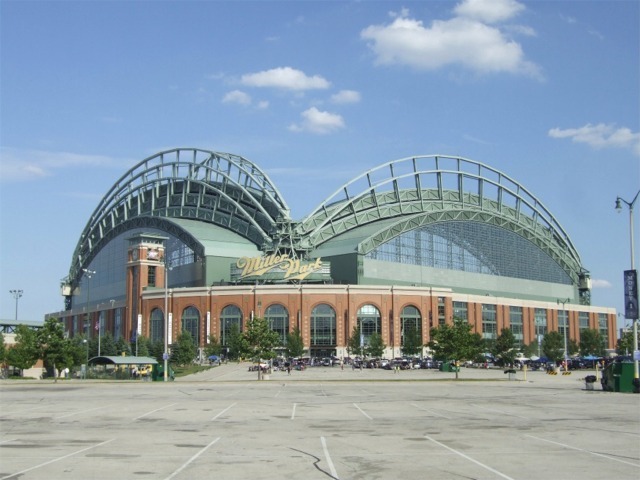 In the parking lot of the Brewers ballpark you will find the best tailgating experience of any in baseball. 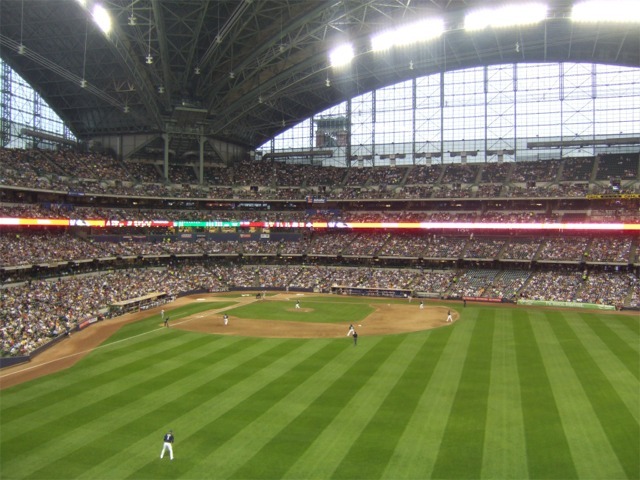 Brewers fans have a passion for baseball whether their team is winning or losing, always coming out to support them at Miller Park. 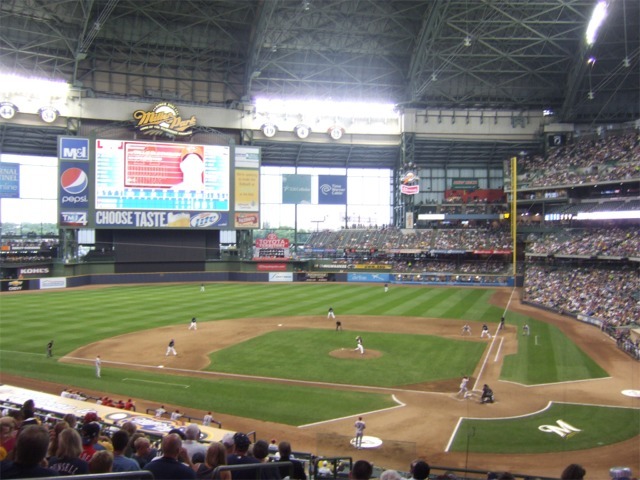 The Brewers played their first game here on April 6, 2001 against the Cincinnati Reds. 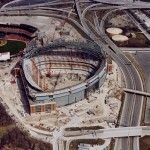 Their quest to open a new ballpark in order to replace County Stadium began in the 1980s. 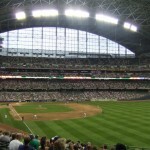 Owner of the Brewers, Bud Selig, wanted a new stadium in order to generate additional revenue for the club. 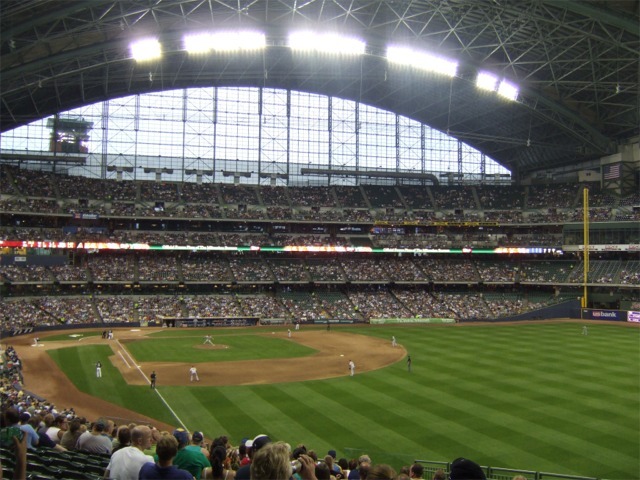 By the 1990s Milwaukee officials were in the process of determing how to finance a new ballpark. 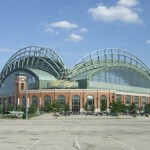 Most city officials and the team wanted a ballpark to be built in the parking lot beyond centerfield of County Stadium. 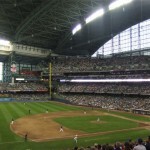 Other officials wanted a new ballpark built in downtown Milwaukee. 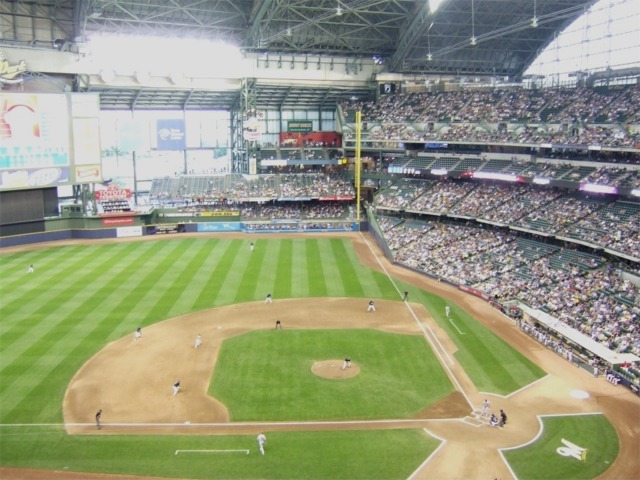 A fan group, Save Our Brewers, was formed in order to save County Stadium, but the Brewers were adamant about constructing a new ballpark. 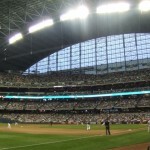 The Brewers unveiled plans for a retractable roof ballpark in December 1995 and the following year financing was approved. 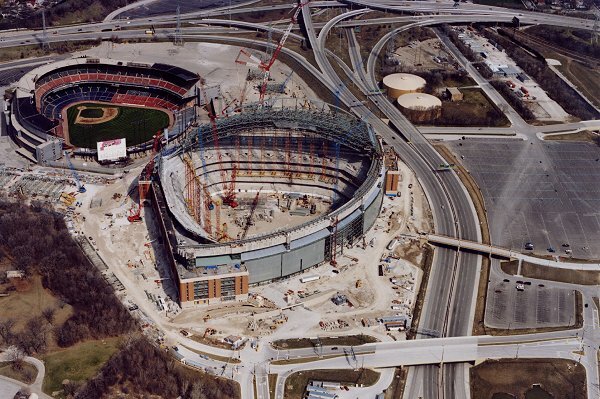 Construction officially began on November 9, 1996 and over the next several seasons fans attending Brewer games at County Stadium could see the new ballpark rise beyond the outfield bleachers. 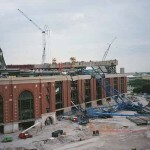 Scheduled to be completed by April 2000, a tragic crane accident killed three workers and destroyed part of the first base side of the ballpark in 1999, pushing the completion date to 2001. 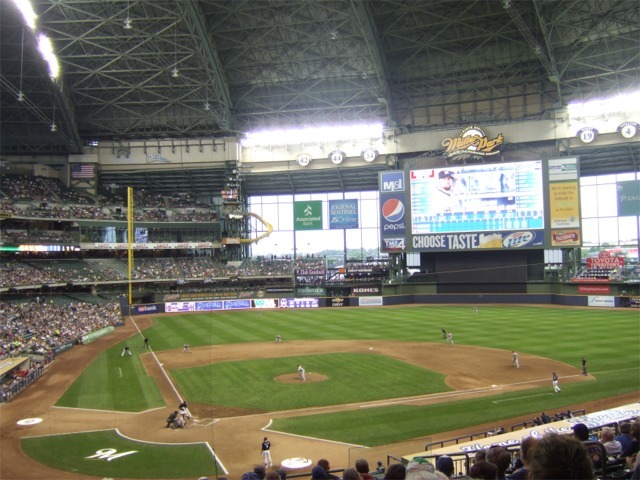 Named after the Miller Brewing Company, Miller Park is a grand structure with its facade consisting of red brick, arched windows and a clock tower at the homeplate entrance. 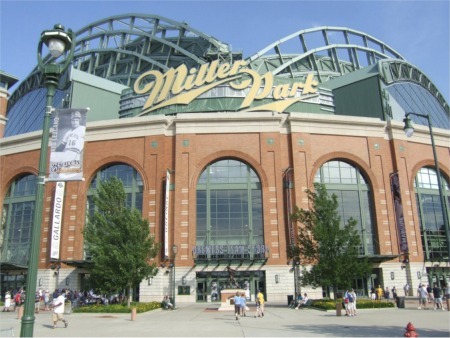 Directly outside Miller Park are statues of Milwaukee icons, including Hank Aaron and Robin Yount. 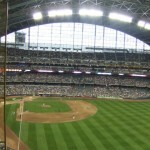 More impressive whether inside or outside Miller Park is the retractable roof. 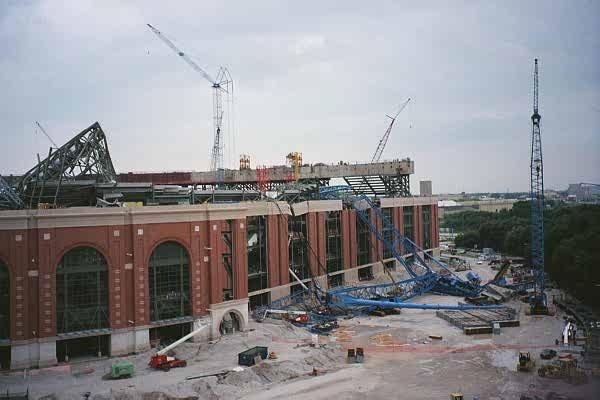 The 12,000 ton, seven panel roof has a unique fan shape design. 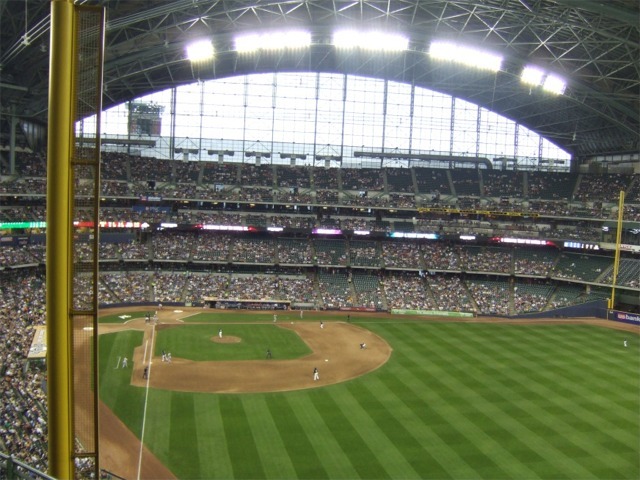 It can open or close in ten minutes and sits 175 feet above the playing field. 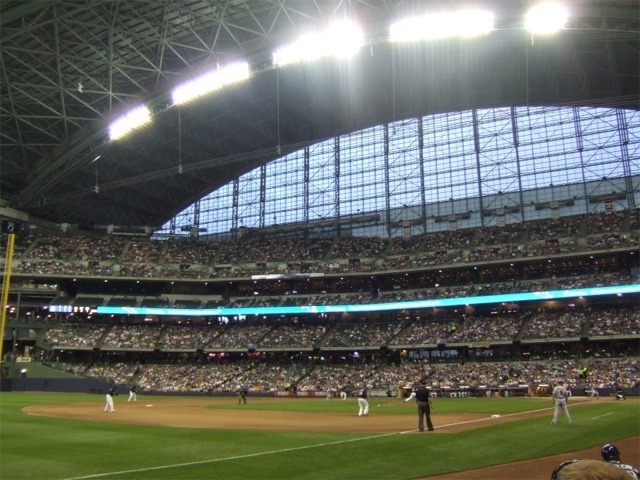 Miller Park has no air conditioning, but an air circulation system keeps the ballpark thirty degrees above the outside temperature when the roof is closed to keep fans warm on chilly nights. 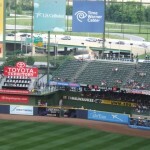 Yankees’ Alex Rodriquez hits his 400th homerun on June 9, 2005. 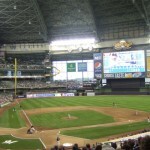 Franchise record 50 homeruns by Prince Fielder in 2007. 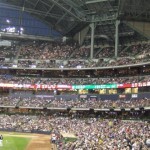 Silver Slugger Award winner Ryan Braun in 2009 & 2010. 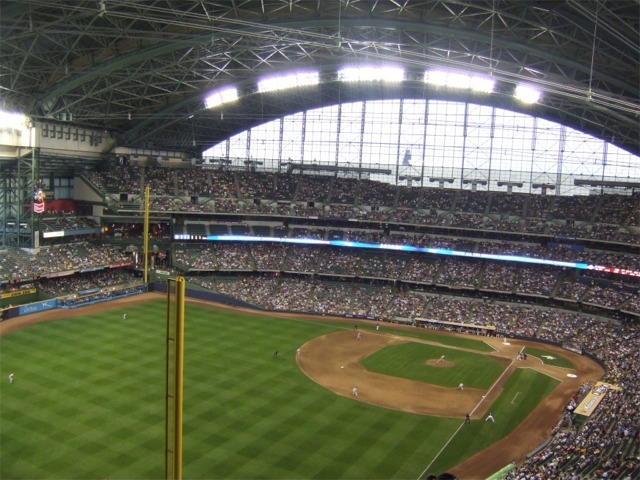 Once inside Miller Park, fans can choose from a variety of seating areas, all with great views of the field. 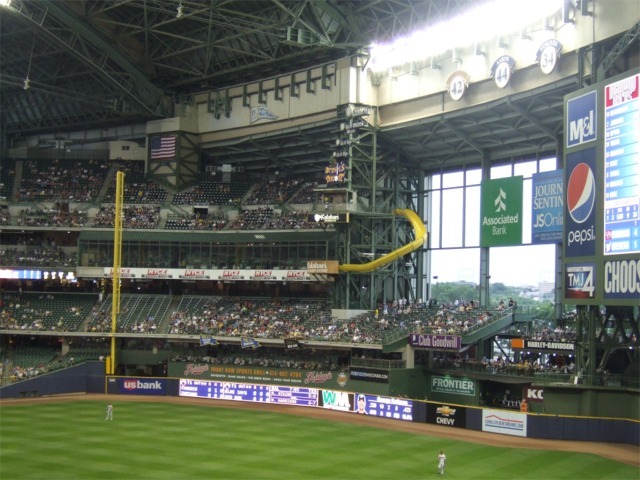 The ballpark has a seating capacity of just under 42,000 consisting of the main four tier grandstand that extends from homeplate to both foul poles. 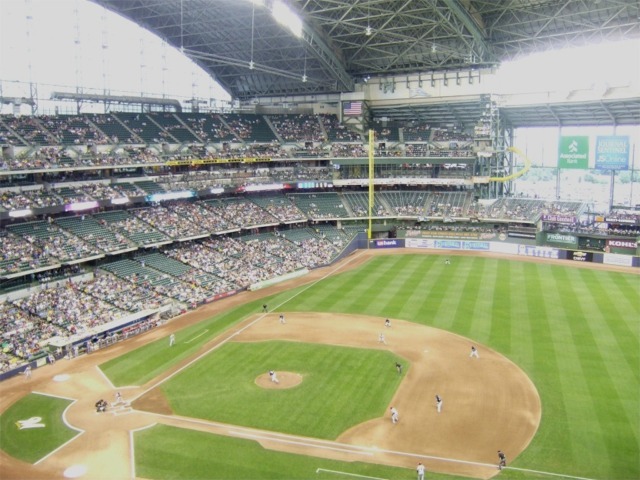 The Uecker Seats, named after legendary Brewers broadcaster Bob Uecker are located in the upper deck terrace level behind home plate and are only $1 because the seats have an obstructed view caused by the roof pivot. 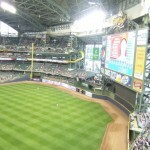 A massive 105 feet high by 168 feet wide HD video/scoreboard is above the hitters backdrop in centerfield. 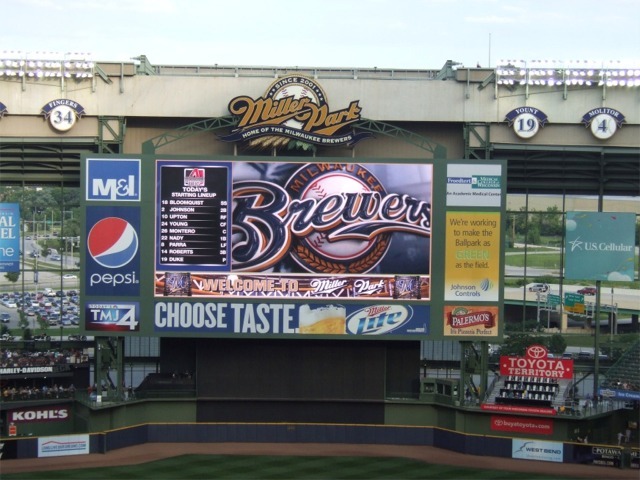 Manual scoreboards located on both the left and right field walls keep fans notified of scores of other MLB games. 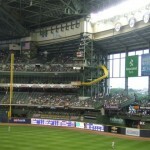 With the move from County Stadium to Miller Park, came Bernie the Brewer and the racing sausages. 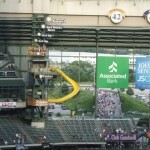 A new home for Bernie the Brewer was built and is located in left field with his classic home and slide. 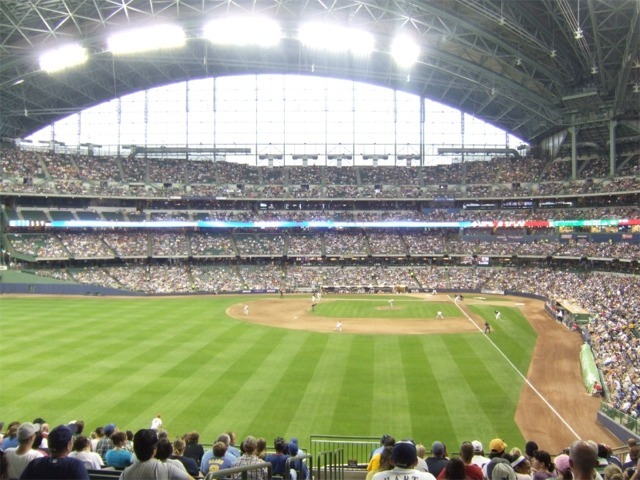 Miller Park has many amenities that could not be found at County Stadium. 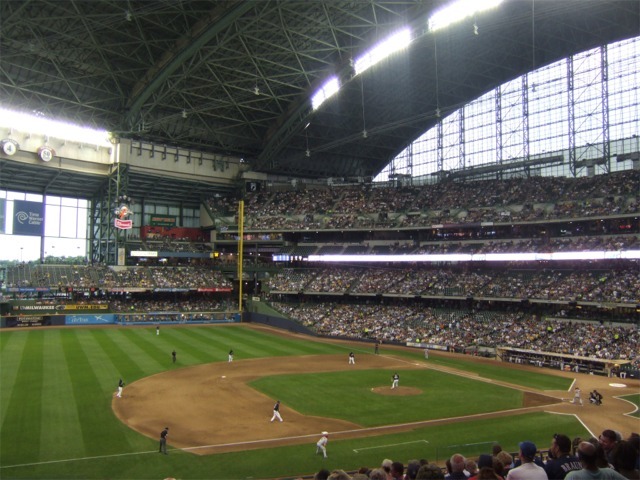 A Brewers Hall of Fame, children’s area, brew pub, open air patios and walkways are throughout Miller Park. 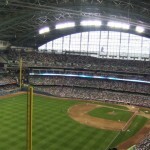 Fans can enjoy dinner and a ballgame at T.G.I. 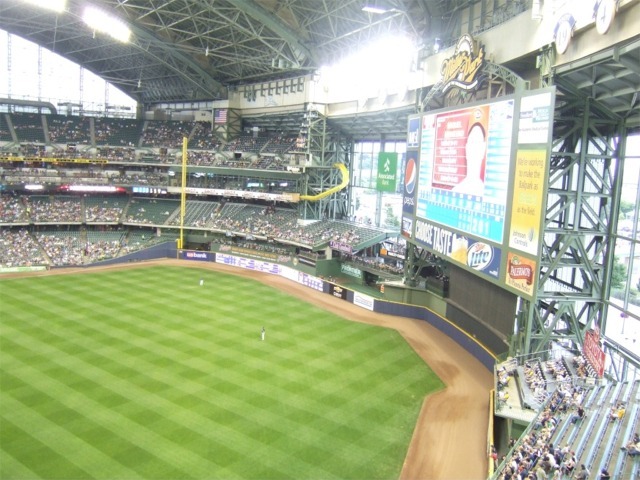 Friday’s Front Row Sports Grill that is located in the left field area known as The Front Row. 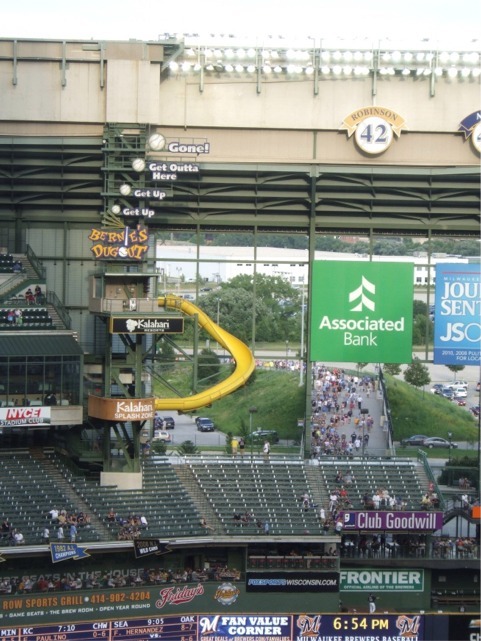 Kids can enjoy the Miller Park Kids Zone, an 8,000 square foot interactive play area, that includes a replica of Bernie the Brewer’s slide. 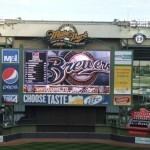 Fans can buy their favorite Brewers merchandise at the team’s new store at the homeplate entrance at Miller Park. 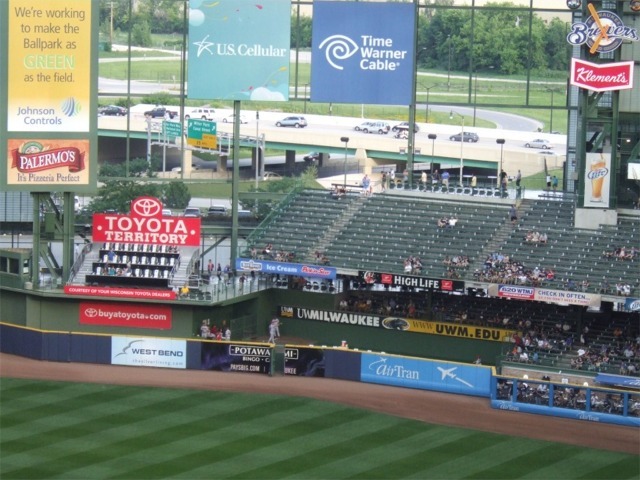 Upscale dining can be found at the Johnson Controls Stadium Club on the club level down the left field line where fans can dine and have a panorama view of the ballpark. 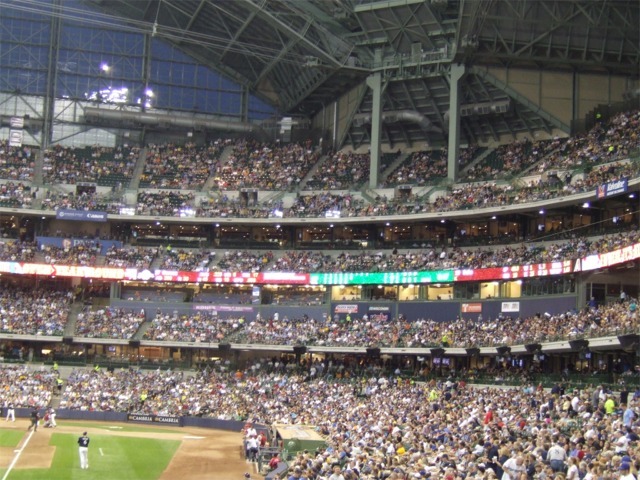 Brewers fans are some of the most passionate fans in baseball as they support their team whether winning or losing. 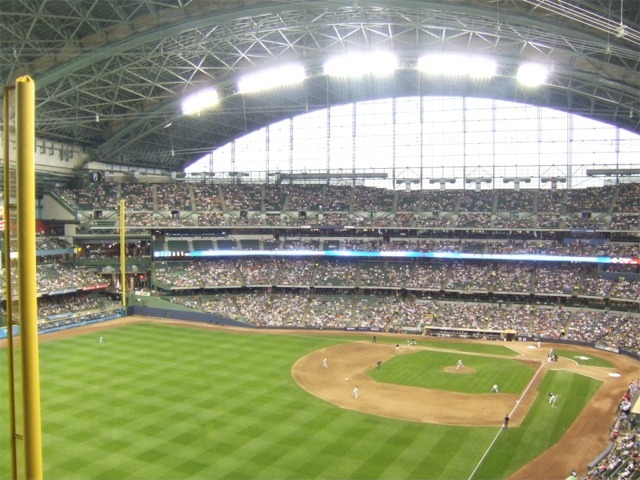 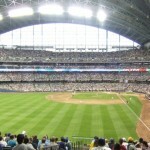 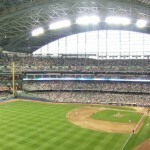 A great atmosphere can always be found at Miller Park. 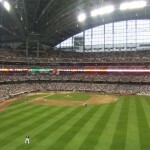 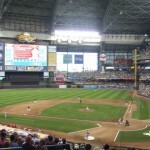 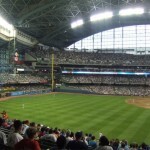 In January 2019 the Brewers announced that American Family Insurance will replace Miller Brewing as the naming rights sponsor the Brewers Stadium.. 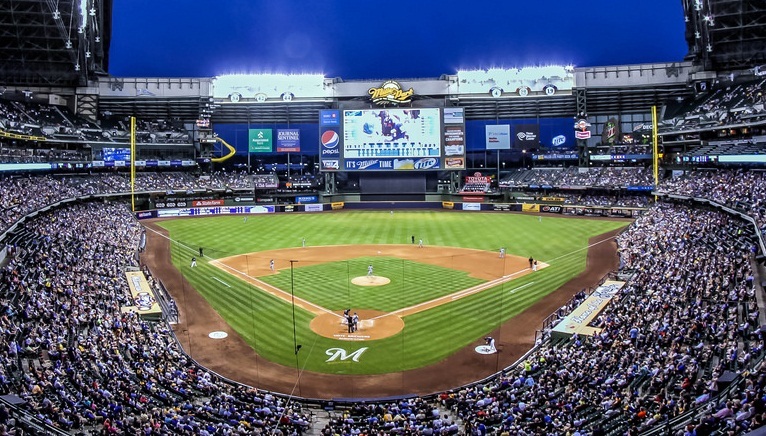 The 15 year agreement begins in 2021. 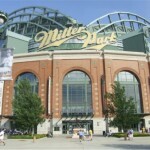 An official name of the ballpark will be announced at a later date. 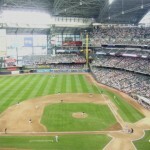 "First Pitch" Milwaukee Brewers at Miller Park Poster - Click to Buy!